Linux/Open Source Recruitment Landscape: New Linux Job Board on Kerneltrap...but, be careful! New Linux Job Board on Kerneltrap...but, be careful! Perhaps some of you have seen, but there is a new Linux kernel job board on Kerneltrap . We have been big fans of Jeremy's throughout the years, and we enjoy the site. We have even advertised on it in the past, which would make sense since we have a number of Linux kernel searches that are ongoing. My only concern is about this new job board partnership that he has with Specialty Job Markets. From some of the comments that I was reading and the responses they received, I am concerned that Specialty Job Markets will not always inform candidates where they are being sent. Christopher Lozinski, founder of Specialty Job Markets, even admits that he does not have agreements with all the companies he splatters candidates resumes to. Being in the recruiting business for 10 years, that is concerning to me. Hopefully, he is in full communication with these candidates. But, by the number of job boards he runs with what appears to be a small staff, I am not sure this is possible. He mentions in one posting that he is helping get rid of spam, but ironically he is also creating spam if he sends resumes to companies he does not have agreements with. Anyhow, just a word of caution, make sure you know where your resume is being sent. You are entitled to that, and it is only ethical. Give me a break. I read a lot of vitriol into this posting. There are also a number of specific accusations. Let me address both the attitude and the criticisms. First let me respond to the vitriol. I have no problems if a candidate or client criticizes me publicly. That is actually very healthy, I have had excellent bug reports on kernel trap, but it seems a little odd for the competition to be taking pot shots at each other. I can understand their concern, because they used to be top dog in the google search for "linux kernel job", or "Linux Kernel Resume" and now we are! A lot of managers or candidates will do a Google search, find us first and then not get to the second string player in this market. So I can understand their desire to be critical of my business process. But there is nothing here for me to be ashamed of. Actually I am very very proud of what I have accomplished here. As Steven Jobs says, "Every overnight success takes a very long time". I take the criticism as a compliment that linux hot jobs has noticed this service. In contrast before I got the email, they were not at all on my mind. Thanks to Jeremy for notifying me about this posting. On to responding to the specific comments. I do not spam. I do send emails out to hiring managers. It is a pretty high quality data feed. All the managers who get my emails, signed up on a specific job board, and are free to unsubscribe. My ISP would shut me down if I spammed. US managers get US candidates, not people without work permits, Europeans get European candidates, and they all get a brief blurb describing the candidate to see if there is a match. I generally think that they find the emails a good experience. I have a very low rate of managers unsubscribing. Once a manager is interested in a candidate, I ask the candidate if he is interested in the company. At this point their is no obligation on either party. Sometimes I will encourage a candidate to interview, sometimes I will discourage them, based on whether I think it is a fit. My loyalty is to the long term relationship, not to closing a specific deal. In fact I do not send out resumes. I send out links to my web site. While that is a technicality, it gets to the core of finding a job on the internet. If you post on my website, if the resume looks good, I publish it anonymously. That should be pretty clear from visiting my website. 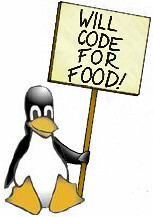 I am attempting to create a marketplace for Linux Kernel Developers. And a marketplace should have lots of product available, and be visible to the buyers. That is what makes a market. And yes some new postings get emailed out to managers, but that is just a service so they do not have to check back. The core idea is to create an open market. This is also in some sense not my decision, it is Googles. They value content! And I think rightly so. We get higher page rank, because Google and the managers can see the resumes on our website. Is there a problem with that? I think not. Anyone who says resume copyright, or do not post, we do not post. And that also happens very very seldom. Publishing your resume widely is central to getting the best possible job. I once did a salary survey on my candidates, and tried to correlate the data to the salary numbers. After much mathmatical analysis, the kind of stuff they taught us at MIT, I finally figured out a very simple rule. The people who are open to the most job offers get the best job offers. I try to create a market place, and to participate in a market place you need to offer your services, and let the buyers find out who they are interested in. An open market place is really best for both the candidates, and the managers. And of course you should always be cautious of recruiters who only get you a single interview, you will never get competing job offers from such a recruiter. I worry more about recruiters who control the flow of resumes, then those who offer an open market. Here is the challenge. I encourage you to post your resume widely. No need to only do business with me. Will the other recruiters match that offer, or do they encourage you to only give your resume to them? Which approach do you think is better for you the candidate? It turns out that a marketplace is also best for the managers. At some point, I am also interested in letting candidates apply to individual jobs, the software is mostly written, but I am way way too busy to put that into place right away. Well, Mr.Lozinski, I am glad that I got your juices flowing. This posting was never an opportunity to take a "pot shot" at the competition. But, it is apparent that you felt quite differently. What my posting was more geared toward was trying to figure out your business model. And, based on your remarks, I continue to have my concerns. From your posting, it appears that you have some application that takes a set amount of information from ones resume. That in turn gets put into an email that goes out to manager's of specific companies that have signed up for your list. I believe this correct. If not, please explain. However, here is where my concern lies. Do you ever speak to these candidates before you include them in your email to companies? I believe it would be hard to speak with all of them at great length, but if you, applause goes out to you. Secondly, what candidate information gets included in this email? Is it possible that your email goes out to a manager that realizes one of his/her employees are looking for another opportunity? And, does that take place without the candidates knowledge? Those are where my concerns lie. This is not about proving your worth by having a degree from MIT, or the fact that you think it is noteworthy to pound your chest because you think we are second fiddle. None of that matters to me. At the end of the day, it is about being ethical. That will bring you longevity in this business. From your resume, it does not appear that you have been in the business all that long, but hopefully you will realize that as time goes on.